The White House Correspondents Association is belatedly accepting the fact that its annual dinner changes dramatically when the president isn't there. Now there is a lively conversation among the association's members about possibly changing the format and the tone of future dinners. 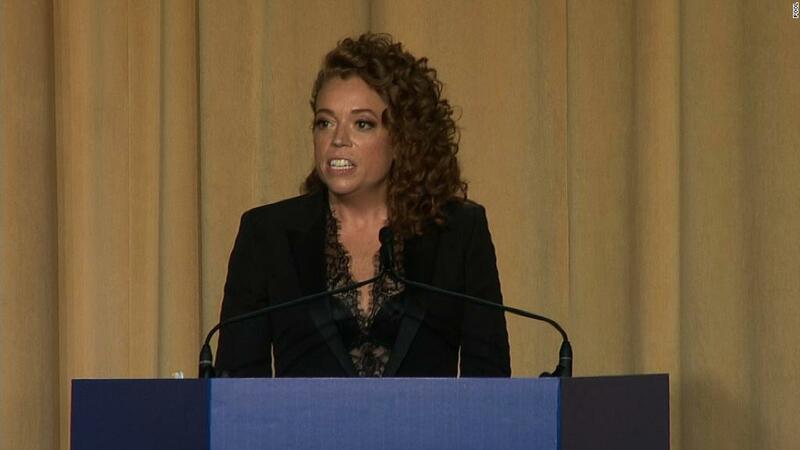 The proximate reason for the debate: President Trump's snubbing of the association for a second straight year and Michelle Wolf's performance at Saturday night's dinner. But this debate predates Saturday night. Aspects of the dinner have been controversial for decades. "As somebody who has said for a very long time that the dinner should be 'boring,' that is to say focused on journalists and the work of good reporters, I am very open to suggestions about how to change it," the association's incoming president, Olivier Knox, said in an interview on Monday. The dinner is a key date on Washington's social calendar. But its organizers admit that it needs to be rethought in an age of increasing political polarization and constant attacks on the media. In interviews with CNNMoney, Knox and other White House correspondents said informal conversations are already underway. "Some people have tossed around the idea of doing a members' feedback sort of thing, such as a WHCA town hall, to get broader input," one association member said. "When the president doesn't come, there's a void. There's a huge void," another member said. "Something has to change." Historically, Knox said, "when the president comes, the program's center of gravity naturally tilts toward the president." After he speaks and ribs the press corps, the featured comedian serves as the counter-balance. With the president absent -- and holding a counter-programming rally -- the dinner has a different feel. Wolf's performance has become an object for partisan warfare, with conservatives claiming it proves the press corps' hatred of Trump. The president himself tweeted on Monday that the dinner was "embarrassing" and the event is "dead" -- indicating he won't be attending next year either. So should there be a change? -- Invite pair of comedians, one with a liberal bent and one with a conservative bent. -- Put the dinner on pause, or end it altogether. -- Change the dinner to make its focus the promotion of journalism and freedom of the press. Yes, the black-tie affair has many critics. They say it makes journalists seem way too cozy with their sources. They say it makes the press corps seem out of touch with America. Scores of news outlets pay for tables at the annual fundraising dinner. The association advocates for White House correspondents all year long. "Any conversation about the future of the dinner has to reflect the fact that revenue it generates keeps our association running," he said. That said, "there's a fairly vigorous constituency inside the WHCA for not having an entertainer," Knox added. There is a widespread impression -- fair or not -- that the press corps is endorsing the message of the comedian on stage. Margaret Talev, the current president of the association, said on CNN's "Reliable Sources" that she didn't vet or even see Wolf's monologue ahead of time. But Talev did select her -- and on Sunday she expressed regret that the controversy over the jokes overshadowed the dinner's First Amendment message. In a statement Sunday evening, she said Wolf's stand-up act did not reflect the "spirit" of the association's mission. Association presidents serve for one term. Talev, a Bloomberg News correspondent and CNN analyst, will hand the reigns to Knox, a SiriusXM correspondent, in a couple of months. On Monday Knox said there hasn't been a formal canvassing of the association's membership yet, "but obviously we're getting a lot of feedback from a lot of different sources." As for next year, he said, "My goal is for the center of gravity of the dinner to be reporters -- not the president, not the comic." The suggestions about a format change have already spurred criticism -- as has all the public debate over the dinner since Saturday night. Jimmy Kimmel mocked the matter in a tweet: "Dear 'the media' -- @michelleisawolf was FUNNY. Hire a juggler next year." And Erik Wemple of The Washington Post wrote on Monday, "The president of the United States is committed to undoing journalism, and the country's top journalists are debating a dinner format."